When you think about it, the fact that we’ve discovered planets around other stars is amazing. In our own solar system Jupiter is the largest planet by far, and yet it’s mass is less than a thousandth that of our Sun. That’s still large enough for us to measure the slight dimming of a star when a planet passes in front of it, or the small wobble of a star as it’s pulled by a planet’s gravity. From these methods we can determine not only the existence of exoplanets, but also their mass, size, and orbit. But in most cases we can’t observe the planet directly, so we can’t observe things such as the planet’s surface or atmosphere. To observe planets directly, we need a way to block the star’s brilliance from our telescopes. There are ways we can block starlight within a telescope, and these methods have been used to observe some large exoplanets directly. 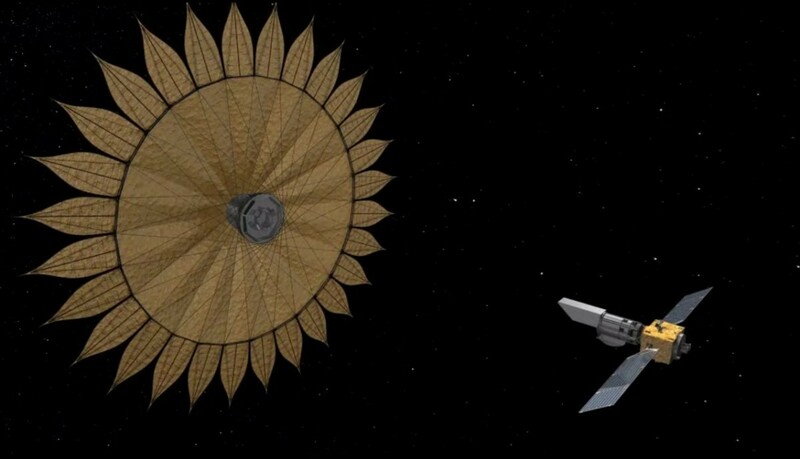 The method isn’t powerful enough to let us observe Earth-sized worlds, but there are methods that could allows us to see Earth-like worlds, and one of them is known as project Starshade. 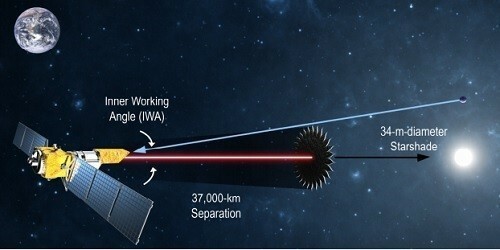 The idea is to launch a space telescope paired with an opaque sail. The sail, or sunshade, would be placed about 37,000 kilometers in front of the telescope in the direction of a star. This would block most of the starlight from the telescope’s view, but still allow the planet to be directly observed. In order to work, both the telescope and the starshade would need to be aligned very precisely, which poses a serious challenge across thousands of kilometers. But if such a mission were successful, we would be able to observe not only planets, but also their atmospheres, which could allow us to observe the effects of life. None of the starshade designs have been approved for an actual mission, but it’s exciting to think that missions to directly observe Earth-like worlds are within our engineering grasp. Has any consideration been given to having an adjustable starshade, rather than a fixed design, that configures to different situations as in different stars or different planetary orbits of the same star? Planets further out orbiting their stars need different shading, do they not? In a manner analagous to adaptive optics, if a starshade is going to be used in front of different targeted environments would an adaptive design be more of an advantage? If so, would that lessen the need to change the position of the starshade relative to the telescope to take into account different distances for different targets? By using this project, we can really able to see a new world. It is a revolutionary thing. So, why this project is not approved ? The cost would be about a billion dollars. It’s always a challenge to get large projects like this approved. I’m not clear on why the shader has to be so far away. Obviously you can put something in very precise locations on the telescope mechanism itself, but it’s clear that doesn’t work or they’d do it. But why? One reason may be that you want the smallest feature of the mask to be many many multiples of the longest wavelength you wish to observe. The bigger the mask, the easier it is to control diffraction. Why can’t we usean asteroid or a KBO occultation to do same observations? It could be limited but much cheaper. Folks have tried observations with chance occultations, but they don’t let you choose your targets.